"I received this recipe from a co-worker about 5 years ago. 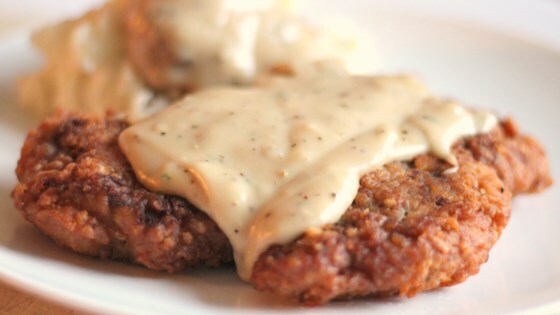 This is by far the best chicken fried steak I've ever had. I've made this numerous times for my picky eater son and my southern-raised better half, as well as other family and friends. I get nothing but rave reviews each time." Heat the shortening in a deep cast-iron skillet to 325 degrees F (165 degrees C). Fry the steaks until evenly golden brown, 3 to 5 minutes per side. Place fried steaks on a plate with paper towels to drain. Drain the fat from the skillet, reserving 1/4 cup of the liquid and as much of the solid remnants as possible. Return the skillet to medium-low heat with the reserved oil. Whisk the remaining flour into the oil. Scrape the bottom of the pan with a spatula to release solids into the gravy. Stir in the milk, raise the heat to medium, and bring the gravy to a simmer, cook until thick, 6 to 7 minutes. Season with kosher salt and pepper. Spoon the gravy over the steaks to serve. Yum! I recommend salt and peppering the meat before dipping it in the flour and buttermilk mixture. Otherwise, the meat itself tastes bland. This is a great coating.I have for years frozen my left over buttermilk in 1 cup containers. Just shake to incorporate the butterfat and milk, works for me every time waste not want not.